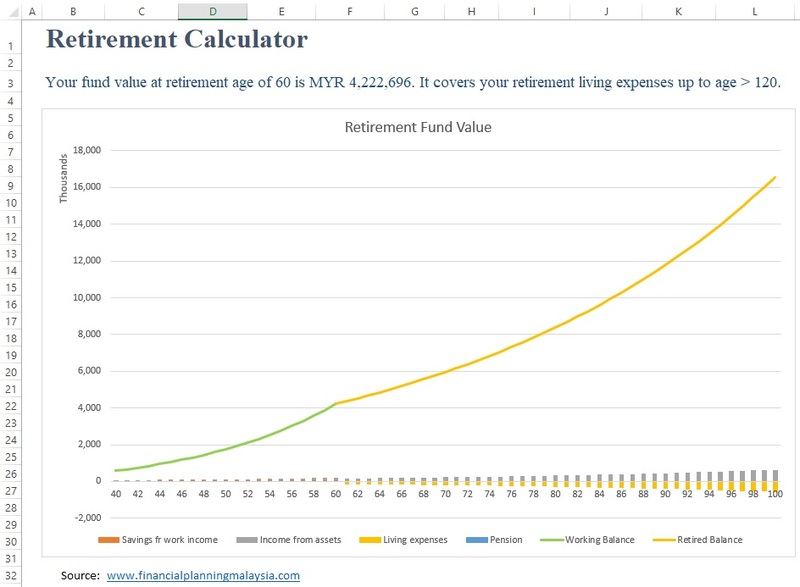 It helps you to calculate the value of your retirement fund based on a few simple factors like your age, monthly savings, savings balances, inflation rate, desired living expenses at retirement, etc. It produces the chart below. 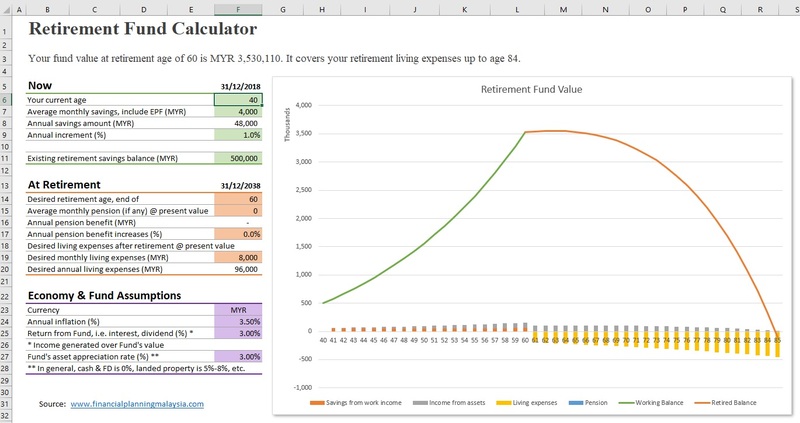 Enter a few simple variables in the highlighted color cells to calculate the fund value at retirement age and your age it can cover your retirement living expenses. Retirement Fund Calculator. Click the image to see the full size of image. 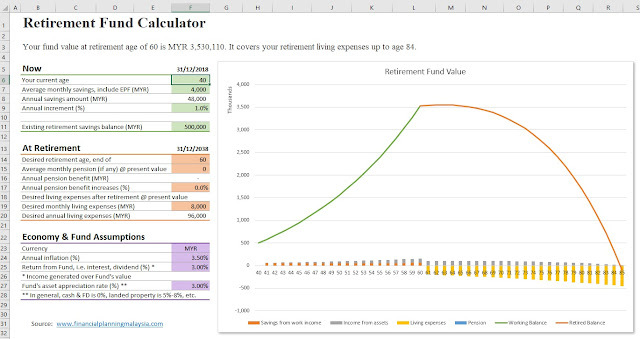 You can download the Retirement Planning Calculator Excel file here. 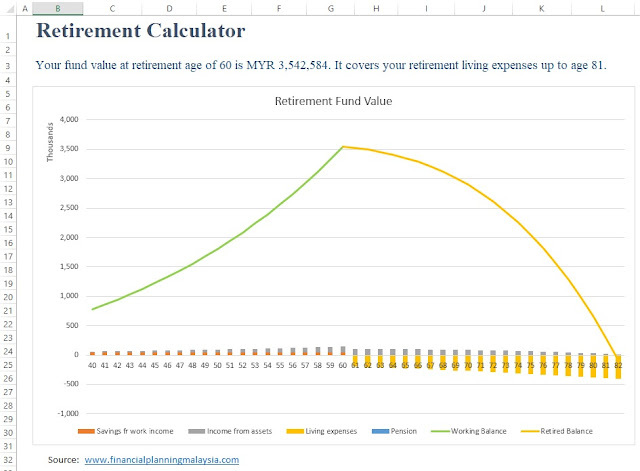 The shape of the graph above is a tad bit depressing as it seems you may outlive your retirement fund. There is a better way to plan. A good retirement planning will give you a more inspiring chart like the one below. You can be sure the retirement fund will beat inflation, outlive you and leave something for your children. This graph trend is possible when your fund gives you good returns and its value increases over the years. This is possible if you invest wisely in property and dividend stocks. These are the assets that will beat inflation and provide incomes, i.e. rental & dividend, without depleting its own value. I added a variable, annual "Asset appreciation" rate of the fund. This is an ANNUAL rate. The annual rate for assets in cash or fixed deposit is zero. The annual rate for landed property is around 5% - 8%. Ultimately financial planning is about planning of assets that generate income. The ultimate desired result is sustainable and continuous income, the means is building, managing and protecting the assets that generate such income. The GOAL is continuous income, the MEANS is assets planning.